I’ve got Envy Lacquer‘s newly released Sugar Skull collection to share with you all tonight! This collection consists of six fun scattered holo polishes filled with shimmer and iridescent glitters – all of which are available now – inspired by the Day of the Dead which falls on November 1st. Golletes is a scattered berry pink holo with iridescent micro glitter and gold shimmer. Shown here is two coats plus top coat. This polish is very easy to control and has great coverage! The iridescent glitters go perfectly with this shade of pink. This polish is so fun! Papel Picado is grape purple scattered holo with added shimmer and iridescent micro glitter. Shown here is two coats plus top coat. The formula here is amazing! It’s so easy to control which means I barely had any clean up to do. I am really loving the iridescent micro glitter throughout this entire collection. I love how it peaks through the scattered holo. One of my favorites! The depth of these polishes is just insane! Ofrenda is a pine green scattered holo with added shimmer and iridescent and red micro glitters. Shown here is two coats plus top coat. Just like the two previous polishes, the formula is wonderful. Great application, control, dry time, and leveling! This shade of green is absolutely stunning. It’s perfect for the Sugar Skull theme as well as the fall season! Here you can see all of the tiny red micro glitters! Calacas is a sky blue scattered holo with iridescent micro glitters and aqua green shimmer. Shown here is two coats plus top coat. Wonderful formula! The added aqua green shimmer gives this polish a glowing effect that makes it stand out from the others in this collection. I am totally digging this polish! 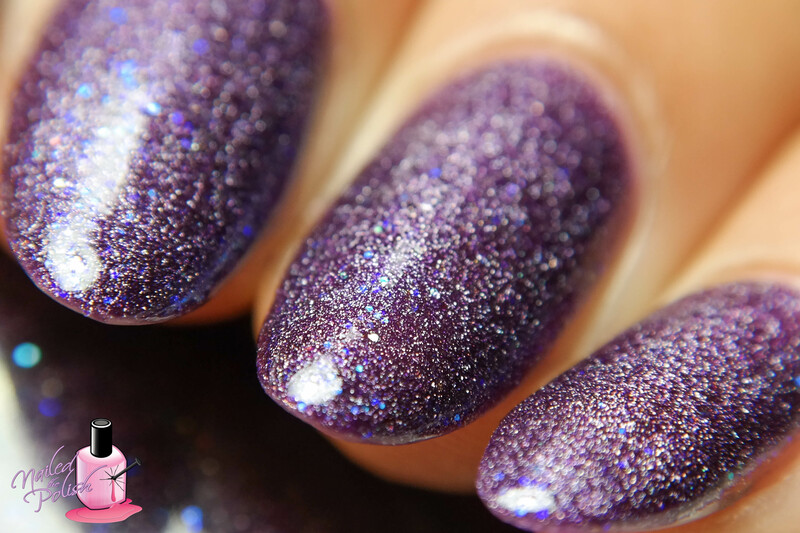 Last up is Illuminaction – a snow white crelly with light scattered holo, iridescent micro glitters, and purple shimmer. Shown here is three coats plus top coat. The formula is a thicker than all the others but it is still pretty easy to work with and levels great. This polish is just so delicate and pretty! This would make a great base for nail art! When I think of Sugar Skulls, I think of bright, fun, vibrant colors and this collection delivers all of that. The color palette is great with a nice variety of colors. The added shimmer and glitter elements make every single polish unique to my collection. Formulas are all pretty exceptional. What I love most about this collection is that you could wear any of these polishes year-round. They are all very versatile and I can definitely see myself using these for nail art! Overall, I really like this collection! This collection along with other new items – Fall Rock Candy trio, awesome vinyls, and gorgeous pendants/rings – are all available now here. Be sure to follow Envy Lacquer on Facebook and Instagram for more!